We're all about moms, all the time. We celebrate mom's journey, bonding with her and her baby from the very beginning. We share mom's pride, joy and excitement with gorgeous newborn photography in the hospital and beyond. We help moms save with unique deals & discounts on baby basics and a few well-deserved indulgences. We offer support with important parenting info and e-newsletters. We have a fun side, a serious side, a BFF side – everything you want in a good friend. And everything you want in a partner through this incredible adventure called being a mom! Mom365 is the largest professional newborn photographer in the U.S.! Our staff of more than 1,700 professional photographers really loves sharing a milestone – baby’s first portrait – right in the hospital. And it doesn’t stop here. Moms can choose to purchase a wide variety of amazing portrait packages, irresistible birth announcements and keepsakes to celebrate the baby. We offer photography for so many phases of mom’s life with her new little true love. Always with an artistic, contemporary approach. Here are all the ways we help capture – and keep – special moments! 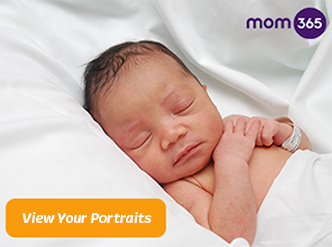 We take baby’s unforgettable first portrait and securely post it to a free Baby Portrait Page. Then mom can share it with family and friends – the waiting is over! Capture the anticipation and love before the baby is even born. Preserve all the special moments and treasure them forever. Photo-journalistic style portraits catch all the details of birthday parties, holiday get-togethers and more. Special times happen most often at home, so our photographers are happy to meet you there. The legacy of incredible newborn portraiture goes back to 1947, when our photographers used a camera called “the Robot” to take black and white photos of newborns in the hospital. • Today Mom365 photographers provide free newborn portrait sessions to more than 1 million new moms and babies a year, every year. • 2013 marks the launch of a new brand called Mom365 along with a magazine and exciting online community for moms. Naturally you can expect even more innovation in the future! Just had your newborn portraits taken in hospital? Sign in here to view them.